This ultra thin heated mattress pad is made of 80% polyester and 20% cotton. It has a 233 thread count and is water- and stain-proof, making it one of the best heated mattress pads on the market. It uses Safe and Warm low-voltage technology for peace of mind. Make nighttime adjustments via dual controls with large, backlit displays. The 5-year warranty is supported by great customer service. This pad gets hot. Most customers use it on level 1 or 2 only. This skirted mattress pad is 100% polyester and machine washable. You can make the most out of the 10 temperature settings for gradual and adjustable heat. Your feet may brush the power cords at the foot of the bed. Some customers say these heated mattress pads run big. The Sunbeam heated mattress pad is a popular one that’s been recommended by massage therapists. It’s 100% polyester and quilted. We love the ThermoFine tech that automatically adjusts throughout the night for consistent heat. The cords are located at the foot of the bed. The large and oddly shaped controller requires 2 hands to adjust. This 100% polyester pad is, as one customer puts it, freakishly soft, but heat isn’t as evenly distributed. The preheat feature, dual controls, and design that places the cords at the head of the bed are all appreciated. 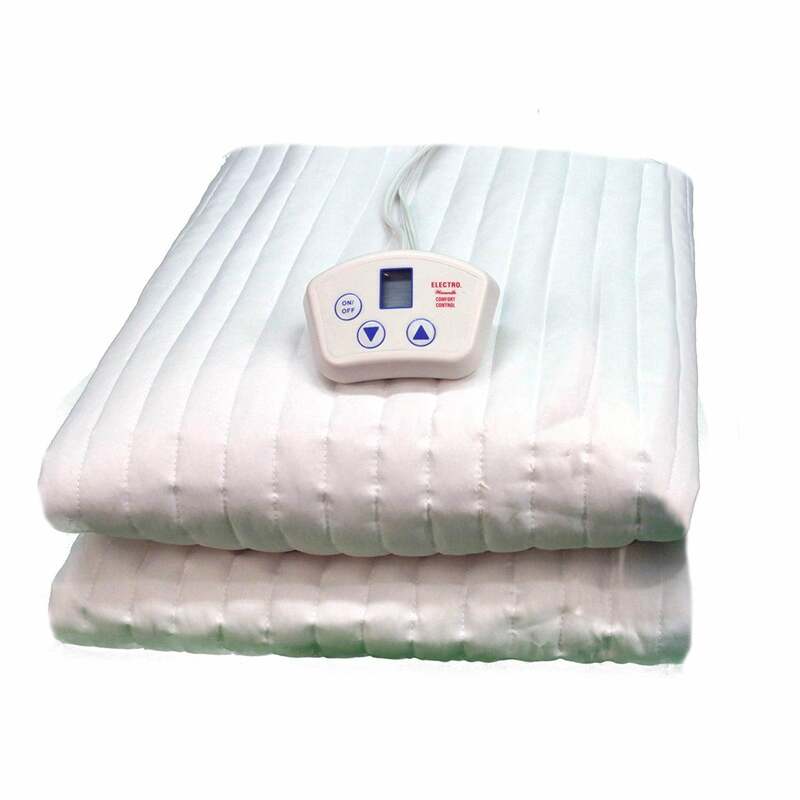 Another heated mattress pad that uses Safe and Warm technology. The foot of the bed doesn’t get warm while the rest of the pad does. Most customers use it on level 1 or 2 only. This 100% polyester pad with a fitted skirt isn’t as sleek as the high-end heated mattress pads but it gets the job done. Electrowarmth has designed its double- and full-size pads with dual controls. This mattress pad heats quickly. This heated mattress pad comes only with a 1-year warranty. The control is difficult to see and adjust in the dark and the foot of the bed doesn’t get warm. Heated mattress pads are total bliss, especially in the winter. They make great gifts for the holidays and we highly recommend treating yourself to one. To make your purchase easier, we warmed up to the mattress pad market and read hundreds of heated mattress pad reviews from verified customers. According to their feedback, we’ve highlighted the pros and cons of the best heated mattress pads above, so you know exactly what to expect when your package arrives. Is there anything more gratifying than curling up in a warm bed after a long day of work? Unfortunately, our beds aren’t that warm when we crawl into bed and using our body heat to warm our beds can be a cringe-worthy experience in the dead of winter. What if we told you there’s a product on the market that can actually preheat your bed for you? Enter, heated mattress pads. These pads fit snugly on top of your mattress and provide varying levels of heat for max comfort. In this buyer’s guide, we’ve outlined features to look for when shopping for a heated mattress pad and other tips for turning your bedroom into a toasty sanctuary. When you’re ready to buy, scroll back up to our comparison chart and browse the best heated mattress pads on the market today. What’s better: electric blanket or heated mattress pad? 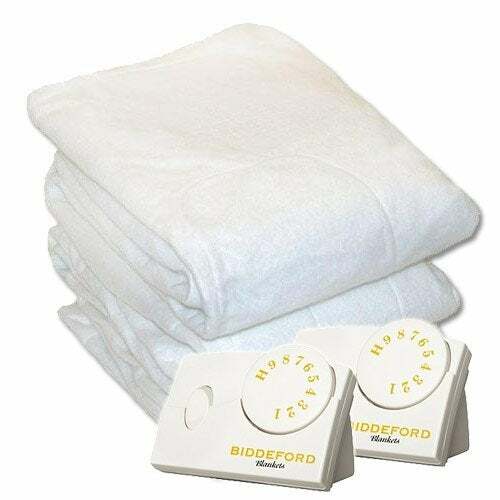 Where the product is situated on your bed is the main differentiator between electric blankets and heated mattress pads. An electric blanket lays on top of you while an electric mattress pad is attached to the top of the bed. Here are some pros and cons to each. Pros—Electric blankets are more cost- and energy-efficient. They’re portable, so you can take them with you in the living room or use them in your home office. They’re available in a variety of styles (think: fuzzy to fleece) and offer a wider heat range—from 1 to 20—than heated mattress pads. Cons—Although they may get hotter than heated mattress pads, half of the heat is lost through the top side of the blanket. Electric blankets also pose more of a safety risk if they’re not kept flat. Pros—Heated mattress pads are well-insulated since they lie beneath you and your bedding, creating somewhat of a heat envelope. They’re covered under a longer warranty of three to five years and they have an automatic shut-off feature—usually after 10 hours so you can still get a full night’s worth of warmth. Cons—They cost a bit more than electric blankets, but they still save money on electric bills when you don’t have to crank the heat as high. They’re also less of a fire hazard. As true for all bedding, you’ll want your heated mattress pad to be soft and comfortable. Most electric mattress pads are made of polyester, which is the least flammable, but some may be made of other materials that are much softer. For example, the Sunbeam heated mattress pad is made from a quilted material while the Serta heated mattress pad has more of a soft, luxurious feel. Adjustable temperature is key to a good night’s sleep. Most electric mattress pads have heat settings from one to 10. We found that most customers keep theirs at level two or three. Having dual controls is important, especially if you sleep cool and your partner suffers from night sweats. Queen- and king-size mattress pads often have dual controls so each sleeper can choose their preferred temperature. It’s a win-win. Electrowarmth offers dual controls on its double- and full-size mattress pads. Electric mattress pads are actually safer than electric blankets because they don’t get as hot as heated blankets and always lay flat. All of the heated mattress pads we featured above have an auto shut-off feature, which means the heat will automatically turn off after 10 hours—just long enough for you to sleep in and still wake up warm. If you’re still concerned, look for heated mattress pads with low-voltage technology: we recommend the SoftHeat or Serta mattress pads. Another safety element to consider: You shouldn’t be able to feel any wires, so look for mattress pads with micro-thin wires. 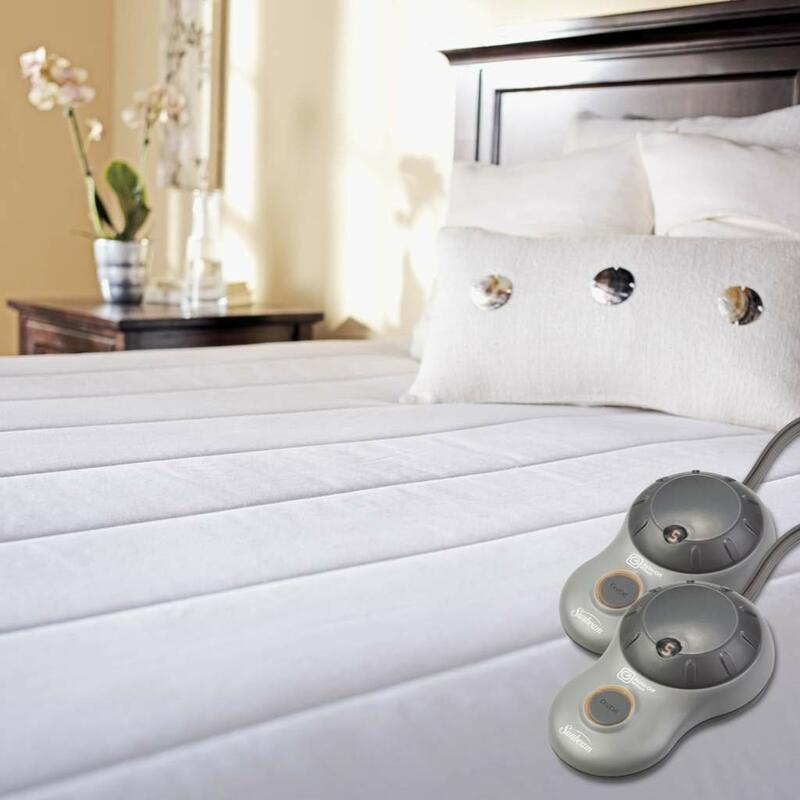 The SoftHeat heated mattress pad has micro-thin wires. A common complaint we noticed from consumers was that some mattress pads are designed with the power cords at the foot of the bed, which tall people have issues with. Look for heated mattress pads that have cords at the head of the bed to avoid tangling your feet with cords. Our body temperature paves the way to a good night’s sleep. Our temp gradually falls at bedtime and continues to lower throughout the night. As morning approaches, our temperature rises again. A major dip or spike in temperature can wake us up in the middle of the night. Here are a few tips to help regulate your temperature before going to bed. Exercise and take your hot shower or bath two to three hours before bed. This allows your body to naturally cool down at bedtime. Set the thermostat somewhere between 60 and 67 degrees. Some doctors say 65 is the sweet spot. Keep your feet warm by investing in a good pair of socks. Control the temperature beneath your bedding by setting your electric mattress pad to a low temperature throughout the night. How long do heated mattress pads last? A heated mattress pad should last five years as long as you follow the care label’s instructions when washing it. Fortunately, most mattress pads are covered by a five-year warranty under which a manufacturer will replace a mattress pad should it stop working before it’s time to buy a new one. Since old heated mattress pads and blankets are more susceptible to fire, be sure to keep yours in good shape to avoid safety risks. Can you use a heated mattress pad with a memory foam mattress? Yes, you can use a heated mattress pad with a memory foam mattress. However, memory foam is susceptible to temperature changes. It can soften in warmer temperatures and harden in a cooler setting. If you prefer a firmer mattress, you may want to use a heated mattress pad at its lowest setting. A heated mattress pad is safe as long as you keep it in good shape. Keep an eye out for tears and frayed material and follow the care label’s instructions for washing and drying the pad. Most electric mattress pads automatically shut off after 10 hours of runtime. Additionally, some heated mattress pads have low-voltage technology to prevent electric shock. 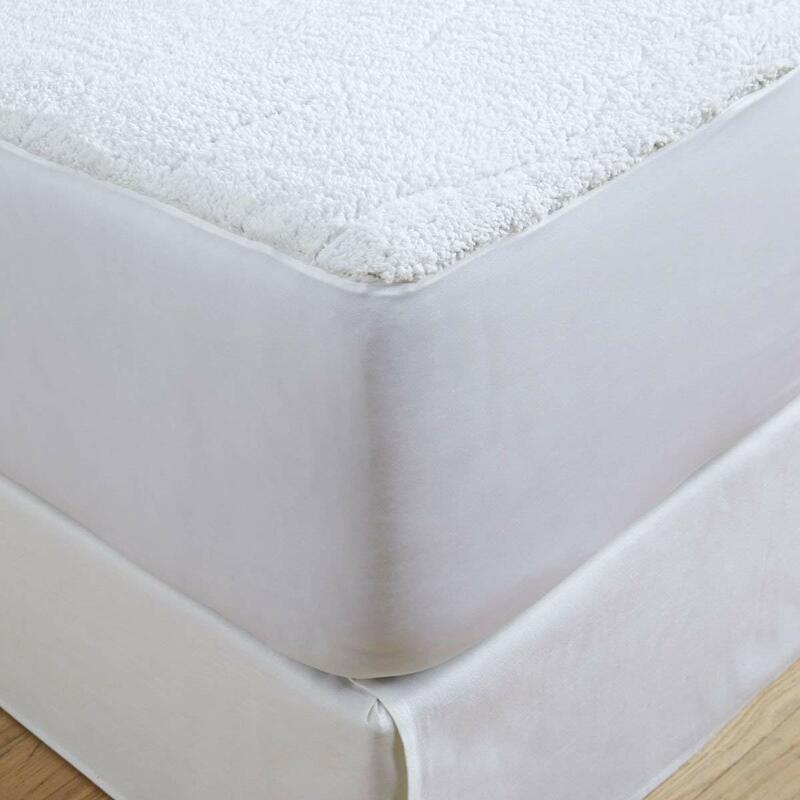 Here's a cheat sheet of all the different mattress pad materials and which one is best for your needs and preferences. We outlined criteria for what exactly you should be looking for before you buy a mattress pad.